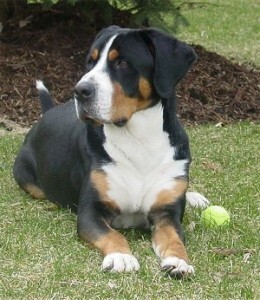 Switzerland has four varieties of farm dogs, and the Greater Swiss Mountain Dog, is the largest. On the farm, his jobs included guarding and herding livestock and pulling carts loaded with milk and cheeses. 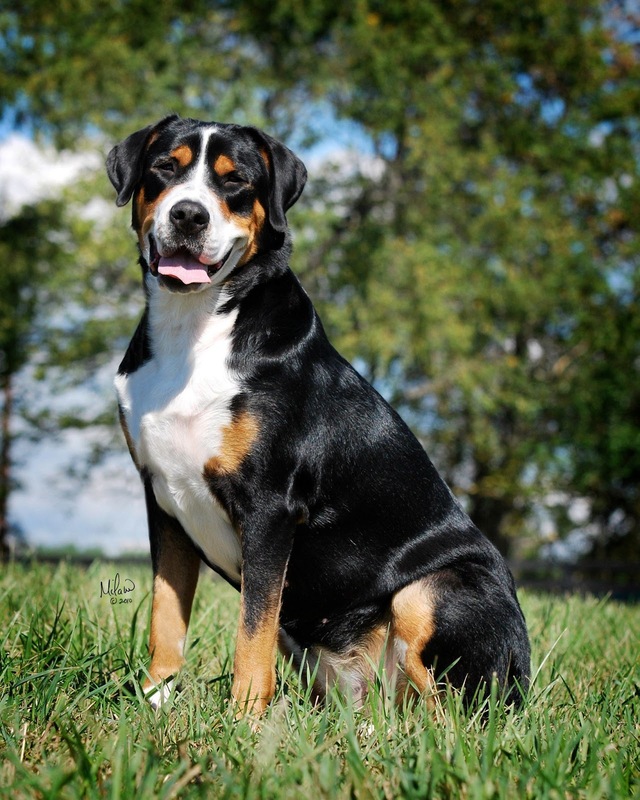 This is a giant breed, with males weighing in at 105 to 140 pounds and females at 85 to 110 pounds. 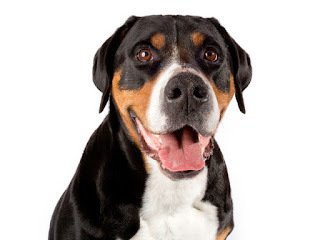 Heim lobbied to get the dogs recognized as a separate breed and, in 1909, the Swiss Kennel Club listed the Greater Swiss Mountain Dog in the Swiss Stud Book. The Greater Swiss Mountain Dog was designed as a draft dog and was often referred to as “the poor man's horse.” They are serious dogs who still enjoy pulling carts and sleds, but have grown to be faithful family companions. They are fiercely loyal to their families and require constant companionship to be happy. 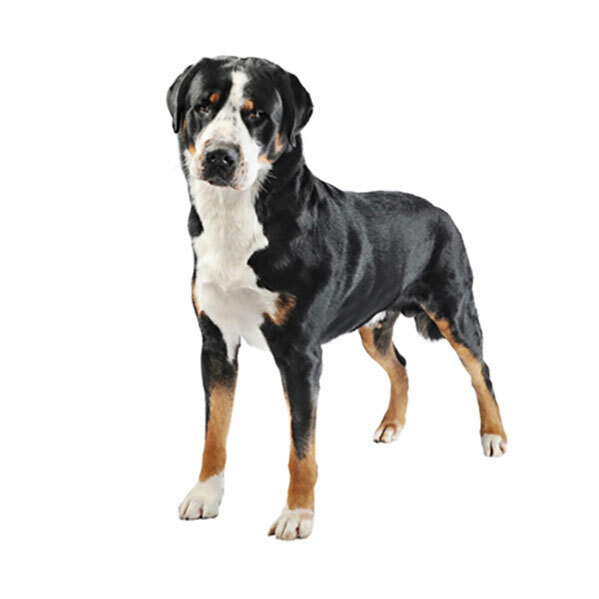 Families with children may shy away from such a large dog, but the Swissy gets along well with kids of all ages. Small children should be supervised, as they can easily get knocked down by an excited Swissy, but the dog never means to harm. They are alert watchdogs, letting everyone in a three-block radius know that a stranger is approaching, but they are not aggressive guard dogs and can be trusted to be polite to house guests, once properly introduced. 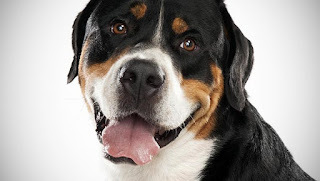 The average life span of the Greater Swiss Mountain Dog is 10 to 12 years. Breed health concerns may include bloat (gastric dilatation and volvulus), epilepsy, elbow dysplasia and hip dysplasia. 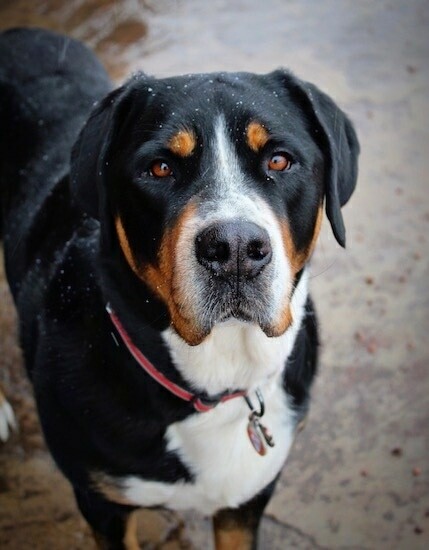 As it is a traditional working dog, this breed is fond of spending time outdoors, particularly in cold weather. It can survive outdoors in cool climates, but prefers to spend more time with its human family. The dog is also fond of pulling. A vigorous romp or a good, long walk is sufficient to fulfill its daily exercise requirements. Indoors, the dog requires a lot of space to stretch itself. Coat care in the form of brushing once a week is enough, but the frequency should be increased at times of shedding. 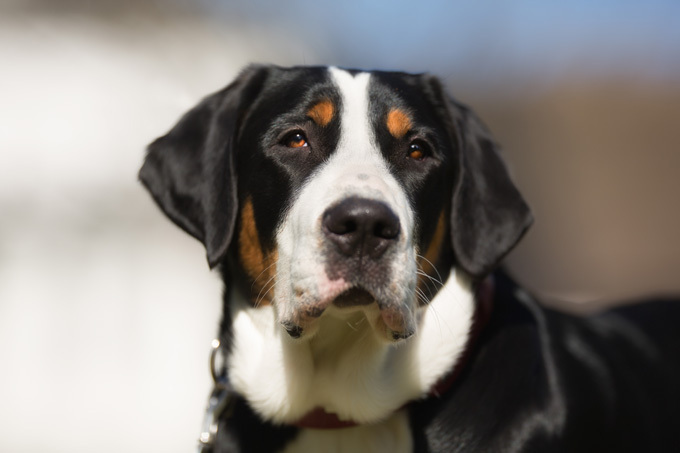 Greater Swiss Mountain Dogs are a challenge to train, even for experienced owners. They are willful and independent, and training should begin as early as possible. Once this dog hits adolescence, he will behave like a typical teenager, testing your boundaries whenever possible. Consistency and strong leadership is key, but a Swissy should never be treated harshly. Training should involve a lot of treats, as this is probably the only way to motivate this headstrong animal. 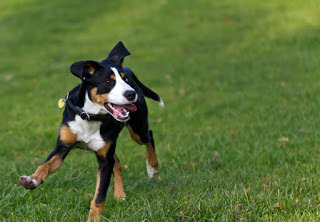 Although Greater Swiss Mountain Dogs require a good bit of exercise, they do not need to run for long periods of time like some other breeds. Several long walks will keep a Swissy happy. He will be even happier if he is allowed to carry a backpack or pull a wagon. The Swissy likes to feel that he is doing a job so incorporating work with fun will make your dog feel needed. Grooming the Greater Swiss Mountain Dog is easy. Brush once or twice per week to keep shedding under control, though Spring and Fall will mean brushing several times per week. Bathe only as needed, which typically amounts to every four to six weeks. Check the dog's ears regularly for signs of irritation, infection, or wax buildup. Clean the ears with a cotton ball and a veterinarian-approved cleanser. Brushing teeth weekly (or more), can keep tartar from building up, promote gum health, and keep bad breath at bay. If the dog does not wear down his toenails naturally, trim the nails once per month. If they make a clicking sound on hard floors, they are too long. Difficult Training: The Greater Swiss Mountain Dog isn't deal for a first time dog owner. Patience and perseverance are required to adequately train it.